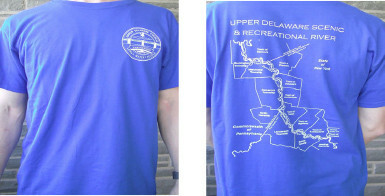 Upper Delaware River T-shirts Make Great Gifts, Benefit UDC - Upper Delaware Council, Inc.
NARROWSBURG – T-shirts featuring a map of the Upper Delaware Scenic and Recreational River Valley in New York & Pennsylvania and the Upper Delaware Council’s (UDC) Land-Water-People partnership logo offer an attractive, affordable gift for river enthusiasts during the holiday season. The 50/50 heavyweight cotton blend shirts are royal blue with white screen-printing. They are available in all adult sizes for a $15 donation to support the non-profit UDC’s mission to conserve the Upper Delaware Scenic and Recreational River. Images of the t-shirts are posted on-line at www.upperdelawarecouncil.org. The circular logo printed on the front left chest area represents a bald eagle flying over Roebling’s Delaware Aqueduct with the Upper Delaware River flowing below. A large map on the back shows the location of the eight NYS towns and seven PA townships which comprise the Congressionally-designated Upper Delaware region, with the river as the common bond. Place an order by calling UDC Secretary Ashley Hall-Bagdonas at (845) 252-3022, e-mail ashley@upperdelawarecouncil.org, or stop by the office at 211 Bridge St. in Narrowsburg, NY (next to the firehouse) between 8 a.m. and 4:30 p.m. weekdays for pick-up. Payment must be by check or cash. Please add $2.50 per shirt to cover postage costs if mailing is requested.